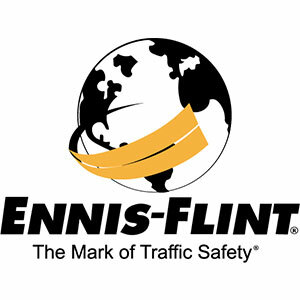 Ennis-Flint is the worldwide leader in the traffic safety industry providing the most comprehensive lineup of road marking solutions on the market today. The EMEA headquarters, located in Chorley, United Kingdom, provides a range of products from traditional paints and thermoplastics to high-performance formulas and plural components for road marking and enhanced surface treatments. You can find Ennis-Flint products on roads and highways, taxiways, runways, parking bays and in all kinds of commercial, contractor, governmental, industrial, airport and architectural settings. WJ Group, the UK’s leading provider of specialist highway products and services, dedicated to road markings, road studs, surface preparation, high friction and coloured surfacing, asphalt repair, retexturing, line removal, speed cameras and equipment manufacturing. WJ has a vision for exceptional service and commitment to Safety, Delivery, Innovation and Collaboration. Accredited to ISO 9001, ISO 14001, 45001 & 44001 we are renowned for a safety focused collaborative approach with our clients to generate best value and sustainable and serviceable solutions. AllGlass was established in 2005 producing and selling drop on, premix and high-performance beads as well as friction materials to markets around the world according to EN1423, EN1424 and AASHTO standards. We have recently achieved ISO14001:2015 by focusing on using recycled and low carbon raw materials throughout our operations. With 150 years experience in the decorative aggregate sector, Long Rake Spar have gained national status as a leading UK supplier of specialist dried aggregates for highways and commercial surfacing. Geveko Markings has been producing road marking material since 1946, our business concept is to develop and provide quality marking materials that contribute to increased road safety. Kraton Corporation (NYSE: KRA) develops, manufactures and markets biobased chemicals and specialty polymers that deliver exceptional value and enhance the lives of people all over the world. SaferFillSystems - removing all the safety issues of filling with LPGas. Proven to improve productivity, saves you time and money. Can you afford not too? W.D.M. Limited is the UK’s leading manufacturer and provider of road survey, highway maintenance and road condition assessment, helping reduce skid-related fatalities by up to 40%. As one of the best digital workflow management solutions in the highways sector, Re-flow supports powerful and flexible forms, job scheduling, field project management, and mapping. Meon are the technical experts in surfacing. Over 25 years of experience and delivering world class solutions to our customers in highways, facilities, public realm and more. All achieved through our expert knowledge and support.